Once again on the lookout, a mystery, a dark matter , choice, hope , when the world choose to close its eyes I open mine and see what the other’s can’t see. I take one step further and make an effort to find an unexplained , to find a question to get an answer , to make a choice to have that change, to walk towards an unknown only to find something new. 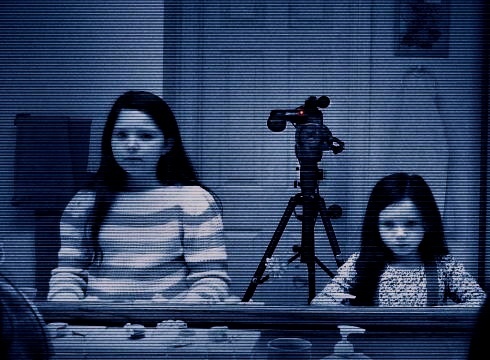 Before we go any further with the run down of Paranormal Activity 3 ,lets understand first what Paranormal Activity really means. To understand this term lets divide it into two. Paranormal :- Paranormal is anything which is beyond the scope of science.anything which science can not explain is paranormal.a kind of experience which is tough to understand or something which suggest that this is not right or this should not happen, we can put this in Paranormal. Activity :- Oh well as the name suggest an Activity ,something which is a do is an Activity. Paranormal Activity :- an activity which is not normal and can’t be define ,out of scope of science. I saw Paranormal Activity 3 recently with my friends about couple of days ago.we were in the office and we decided that since its a festival time lets go out and watch a movie together.going on with the reputation of the previous Paranormal Activity movies we zeroed down to Paranormal Activity 3.so after an hour we were at the cinemax to watch this movie. Oh well what to say about this film but we were kind of disappointed.all of my friends did not like the movie except me.i don’t say that it was a good movie but it was not bad either.it was some kind of average movie.average comparing to rest of the paranormal movies. which is not bad for any movie ,its an average horror flick. The story is set in 1988 , a family of four where two little girls live with their so called parents along with an unknown entity which troubles them every now and then with its activities.well , don’t really know what this thing is.but as you watch the movie you can easily figure it out that its a kid which the little girl name katie interacts with.she calls him Toby.film begins with normal camcorder recording as Dennis ( Christopher Nicholas Smith ) goes around the house recording his stuff.soon he realized that something is not going right in this house.he installs cameras to record at night ,if there is something which is causing problem.he records unusual activities taking place at night and shares it with his friend Randy Rosen ( Dustin Ingram ).Dennis happens to record more activities on camera and decides to share it with his wife Katie ( katie Featherston ). things take deadly turn later and they shifts to their mother home where things take unexpected turn and Dennis and Katie die. One thing you notice about this movie is that there are chills and it does scares you at times.but as it looks like that the movie is building up to something it ends abruptly. Why watch this movie ? Its a horror flick and worth watching for once.it does have its share of scary moments.the setting is nice where you can actually feel the horror and silent surroundings.good acting performance by the two little girls.video and sound editing is spot on.good direction by Henry Joost and Ariel Schulman. Why not to watch this movie ? Its an average horror movie.being this movie screened in india ,most of the scenes been deleted from the original version.so its been an edited movie which is screened in india.its not as good as the original.movie ends abruptly leaving question asking about what really happened. Trailer on youtube is actually different and most of the scenes are not there in the movie. All in all its an average horror movie with its shares of chill and thrill but still fails to scare you as much as the original did in the first place when it was released in 2007.
i give paranormal activity 2.5 out of 5.